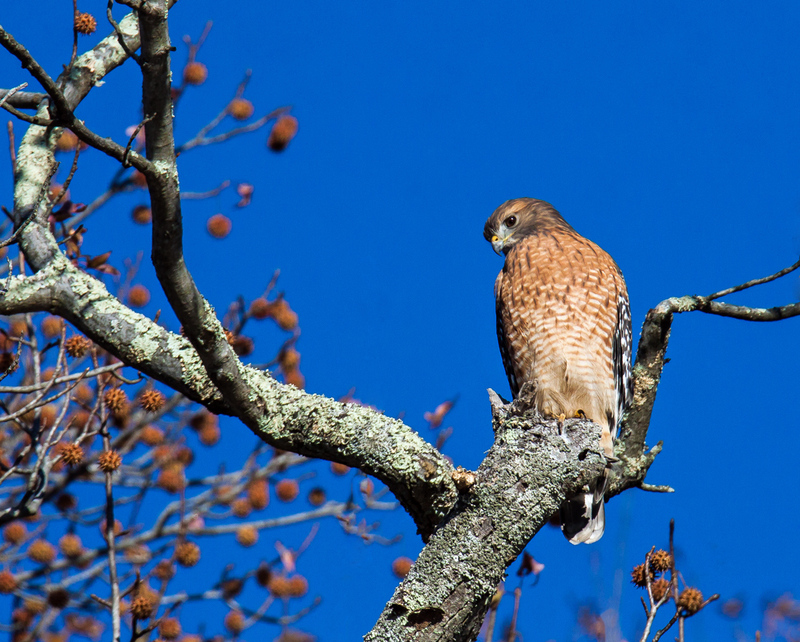 As I was walking along one of the trails last week at Occoquan Bay National Wildlife Refuge, I glanced to the side and spotted this Red-shouldered Hawk (Buteo lineatus) perched at eye level on a tree that was really close. There was a lot of vegetation between us, but I managed to get this shot that did not have to be cropped at all. Initially I did not think that I would be able to capture a usable image, because there was no way that I could get an unobstructed shot. I crouched down a bit and managed to find a kind of visual tunnel that provided a clear view of the head. 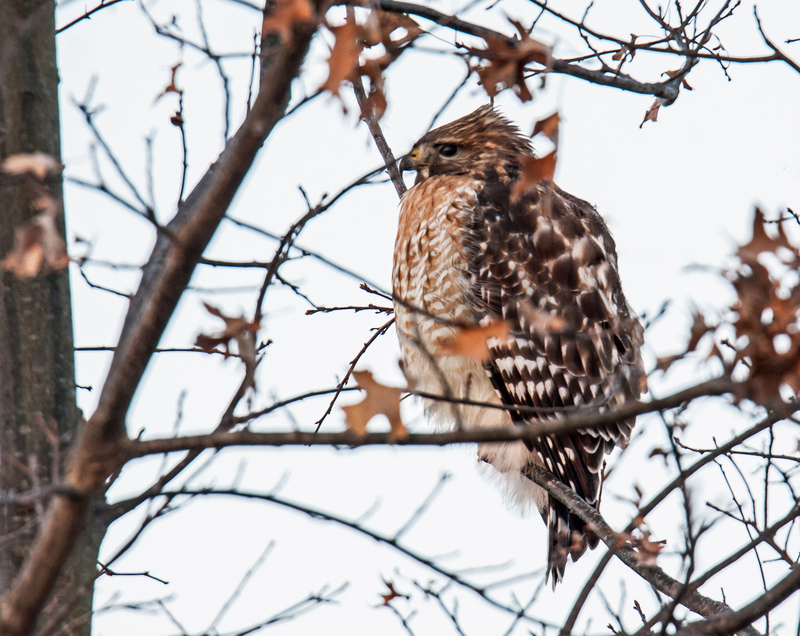 The out-of-focus branches are a little distracting, but they provide the viewer with a sense that they are peering into the world of the hidden hawk. One of the basic rules of portrait photography is that you should try to be at eye level with your subject. 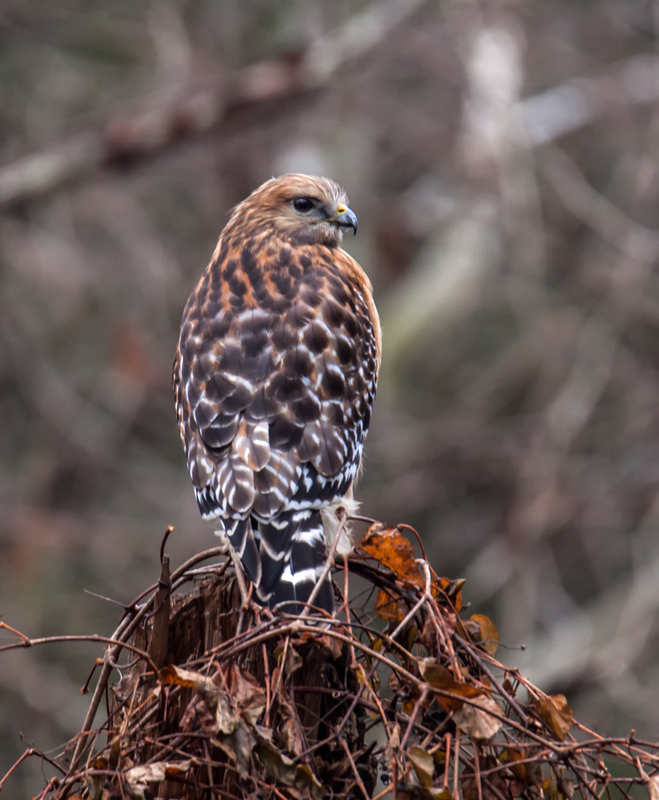 That’s a bit tough to do with raptors, but this past Friday at Occoquan Bay National Wildlife Refuge I encountered a juvenile Red-shouldered Hawk (Buteo lineatus) that was perched very low on a tree and I managed to capture a number of shots of it. 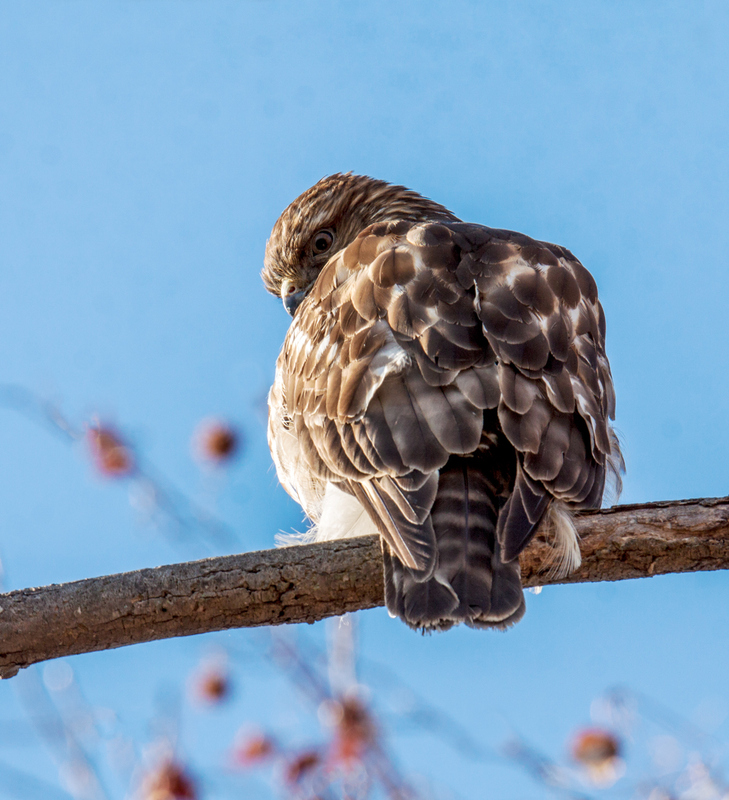 The wind was blowing strongly at the time and my guess is that the hawk was trying to shelter itself from the wind by perching low and from the cold by fluffing up its feathers (as you can see in the the second image). 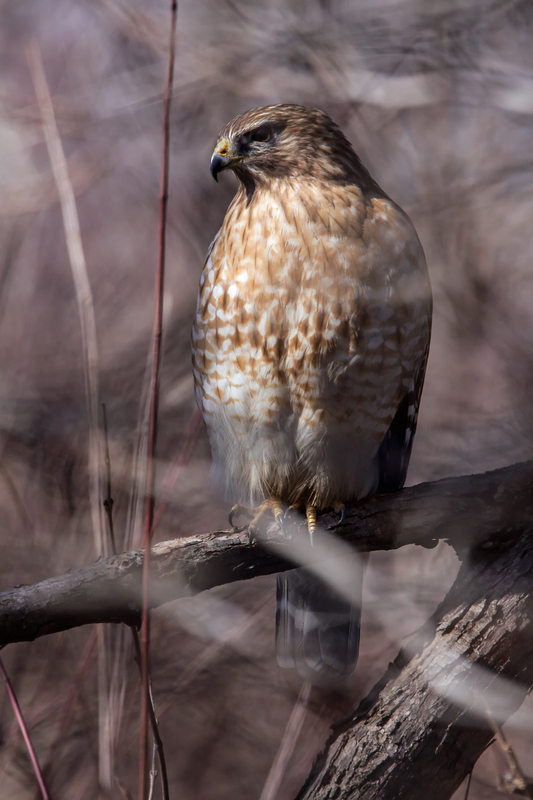 A group of five or so photographers stood on the boardwalk on Friday morning at Huntley Meadows Park watching a Red-shouldered Hawk (Buteo lineatus) in a tree above us. 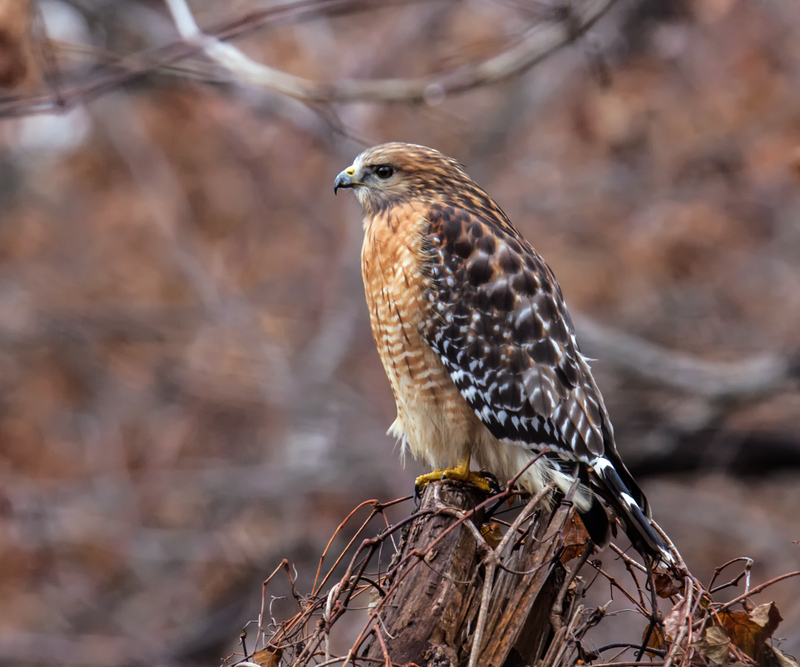 We waited and waited for the hawk to take off and when it finally did so, I almost managed to keep the hawk within the frame. 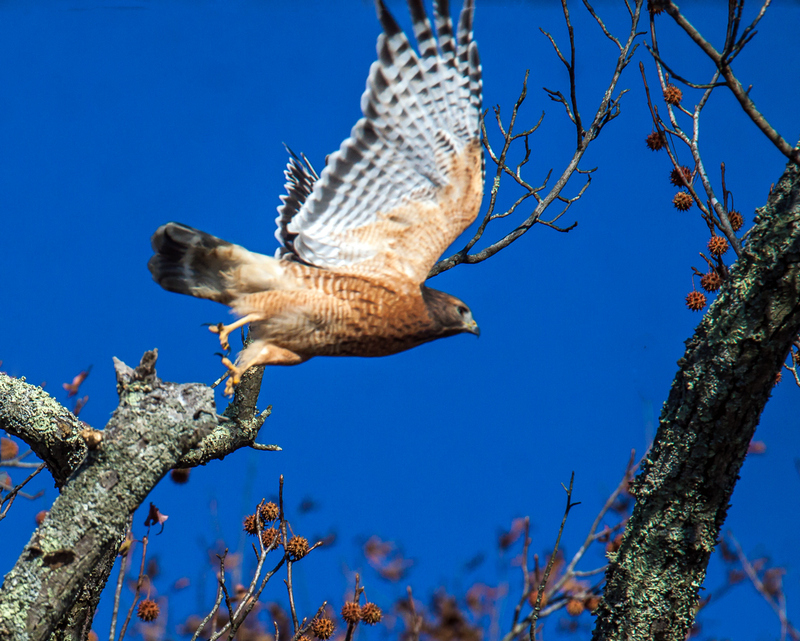 I can’t really complain too much, though, because as far as I know, none of the others managed to get a shot off when the hawk took to the air. 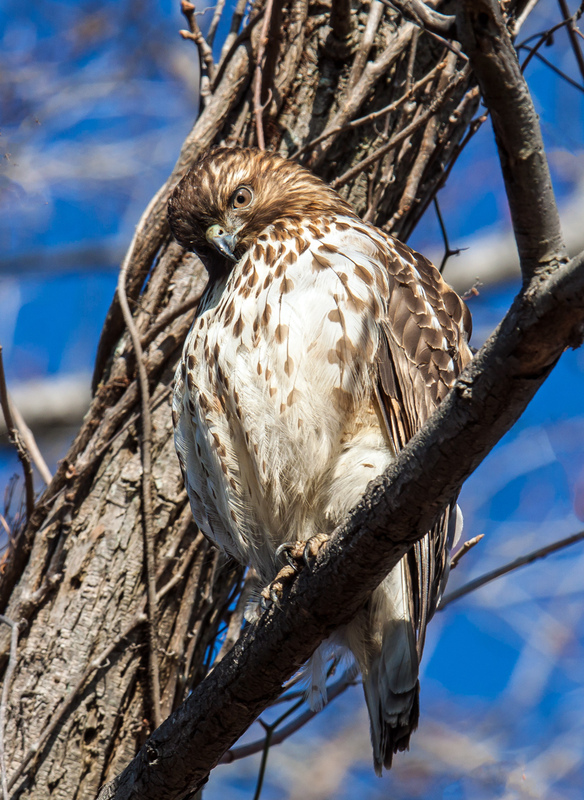 We were in a really good position and the lighting was beautiful, but it is hard to remain alert and ready as you wait for a bird to spring into action. 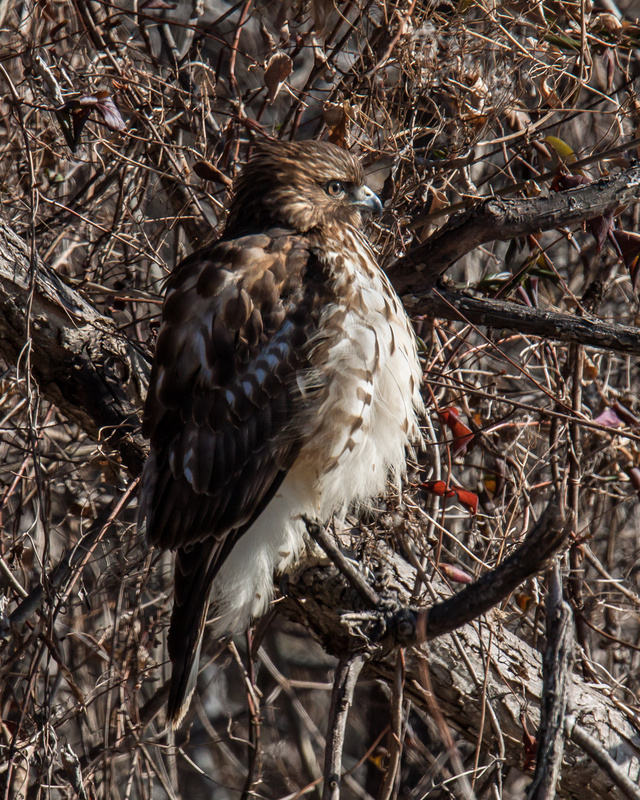 I was using a monopod again and I think it may be the reason why I was able to capture the hawk taking off. 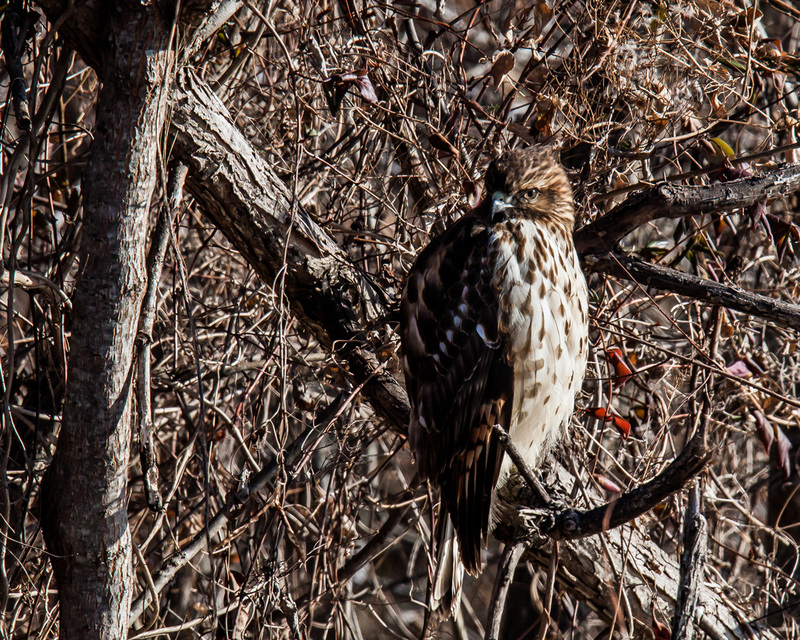 My camera was already at eye level and pointed in the direction of the hawk during the entire fifteen minutes or so that we watched the hawk. The other photographers had to raise their cameras and were not able to do so quickly enough. It might be my imagination, but I also think that some of my shots with the monopod are sharper than they might otherwise be. I have balked a bit at carrying a big tripod, but think that the monopod will now be with me most of the time—it collapses to a pretty small size and, because it it carbon fiber, is both sturdy and light.